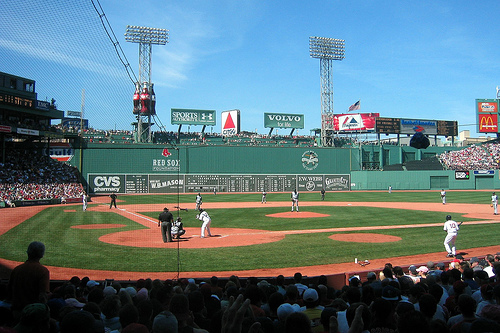 The Cape Cod All-Star Game will be played at Boston's historic Fenway Park. The All-Star game is presented by the leading banks of Cape Cod —- Bank of America, Eastern Bank, TD Bank, Cape Cod Cooperative Bank and Cape Cod Five Cents Savings Bank. Scott Pickler of the Yarmouth-Dennis Red Sox will be the field manager for the East Division, with Harvey Shapiro of the defending champion Bourne Braves piloting the West. Leading the way for the East are Brewster outfielder Drew Martinez (Memphis) and Orleans second baseman Kolten Wong (Hawai’i), who are currently 1-2 in the league in batting average. Wong will be joined on the right side of the infield by Chatham first baseman Aaron Westlake (Vanderbilt). Anchoring the left side will be two players from second-place Y-D —- shortstop Joe Panik (St. John’s) and third baseman Tyler Hanover (LSU). This is the second All-Star selection for Hanover, who was a reserve last year. Martinez will also have a friendly face beside him in the outfield as teammate Cohl Walla (Texas) was named a starter along with Y-D’s Caleb Ramsey (Houston). The designated hitter is Harwich’s Clint Moore (West Point), with Harwich’s Pratt Maynard (N.C. State) named the starting catcher. The Mariners also landed two reserve players in utility man Levi Michael (North Carolina) and outfielder Ronnie Richardson (Central Florida). Chatham catcher Joe Pavone (UConn) fills out the roster. Leading the pitching staff for the East will be Brewster’s Andrew Gagnon (Long Beach State). Gagnon leads the league with five wins and sports a 1.69 ERA through six appearances. He also ranks second with 38 strikeouts. He will be joined by a strong supporting staff that includes teammate and closer Colton Murray (Kansas), Kyle Simon (Arizona) and Marcus Stroman (Duke) of Orleans, Derek Self (Louisville) and Logan Verrett (Baylor) of Chatham, and Adam Morgan (Alabama), Braden Kapteyn (Kentucky) and Matty Ott (LSU) of Harwich. The Wareham Gatemen lead the West Division All-Stars with five selections, while the Braves had three players named. Representing Bourne will be starter Grayson Garvin (Vanderbilt), and relievers, RJ Alverez (Florida Atlantic) and Tony Zych (Louisville). Alvarez and Zych have yet to allow an earned run this summer. Garvin is 3-0 in four starts with a 0.79 ERA. Right-hander Austin Wood (St. Petersburg), who has dominated, going 3-0, with an 0.58 ERA in 31 innings, represents Cotuit. Joining him from the Kettleers is right-handed reliever AJ Achter (Michigan State), who has posted a 1.03 ERA in 10 appearances. Making the team from the Gatemen are right-hander Max Perlman (Harvard) and lefty Jed Bradley (Georgia Tech). Hyannis’ Tyler Ray (Troy) will make the trip to Fenway, along with Falmouth southpaw Christian Jones (Oregon). Falmouth’s Andrew Susac (Oregon State) gets the start behind the plate, with Hyannis’ Cam Seitzer (Oklahoma) at first base, Falmouth’s Kevin Medrano (Missouri State) at second, Wareham’s Tyler Bream (Liberty University) at third and Falmouth’s KC Serna (Oregon) manning shortstop. The starting outfielders are Cotuit’s Chad Wright (Kentucky), Wareham’s Zach Wilson (Arizona State) and Hyannis’ John Ruettiger (Arizona State). The designated hitter will be Cotuit’s Jordan Leyland (UC Irvine). The reserves are Wareham catcher Tony Caldwell (Auburn), utility infielder Casey McElroy (Auburn) and Bourne outfielder Scott Woodward (Coastal Carolina). General admission tickets for the game, priced at $10, are still available and can be purchased on the Cape League website at www.capecodbaseball.org, or at any of the 10 ballparks.